Rumors are circulating at a rapid rate on this great Indiana record buck, calling it the new World's Record at 220 Boone and Crockett. From the little information we have received so far, it appears the buck has been unofficially taped at near 200 Boone & Crockett (B&C) as a typical. Apparently, the Indiana deer was shot in Morgan Co. and it was checked in at the Outdoorsman in Greenwood, IN. 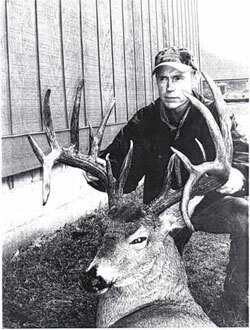 The current Indiana deer state record, a 195-1/8 buck taken by B. Dodd Porter, was taken in Parke County, Indiana in 1985. The Indiana buck was shot by a young teen, not by the man in the picture. More information will surface later.